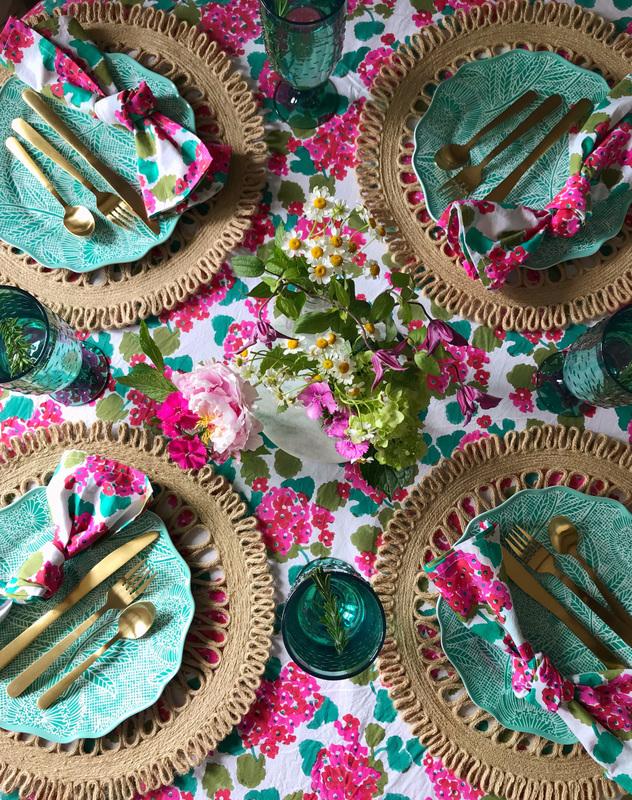 When I’m styling a table for entertaining, I always start with an inspiration piece — something that sets the tone and palette for the whole scene. 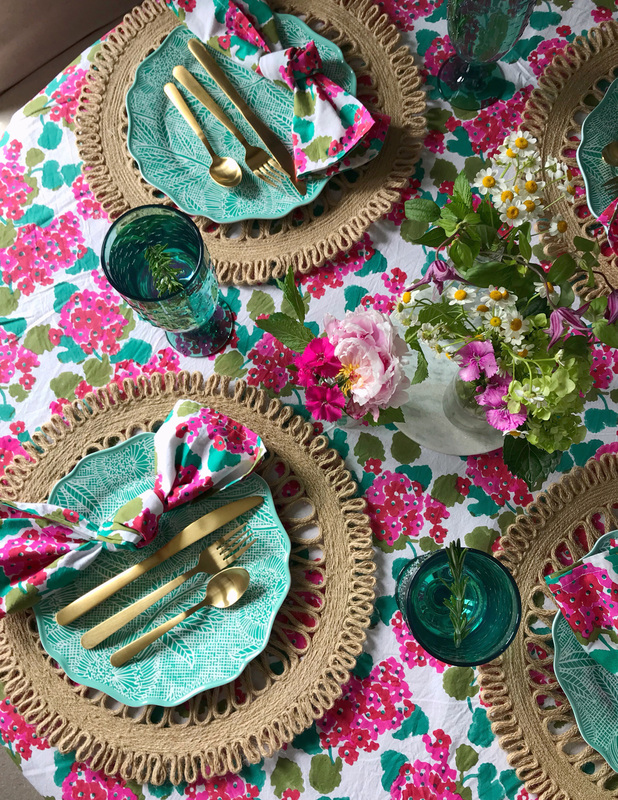 When I received this beautiful geranium printed tablecloth in the mail (from Roller Rabbit, my favorite place to source table linens) the bright punchy pinks and deep jewel-toned greens had me hit the ground running for this colorful summer garden party. 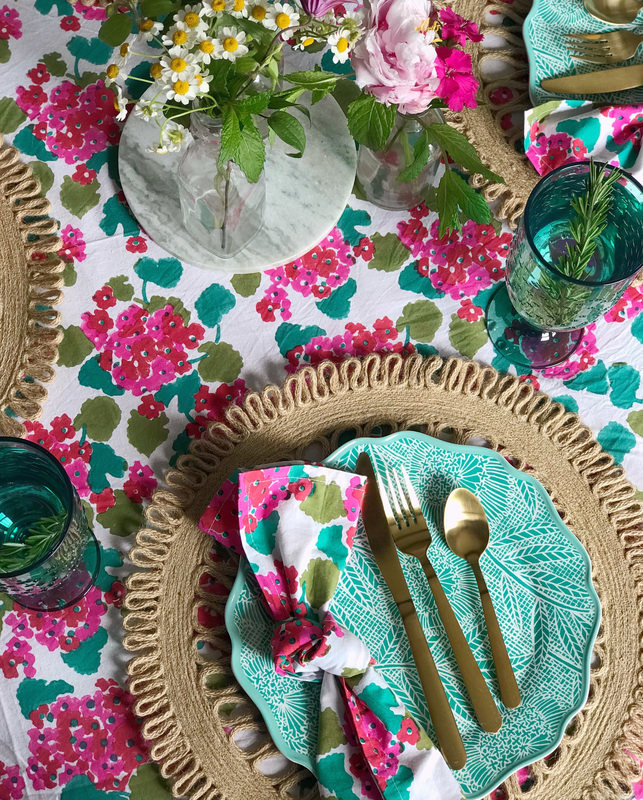 The colors in the table linens just happened to be a perfect match for some of the pieces from Target’s new Opalhouse line — and I love how their plates and cups are melamine which are perfect for outdoor entertaining (and all meal-times with kids!). 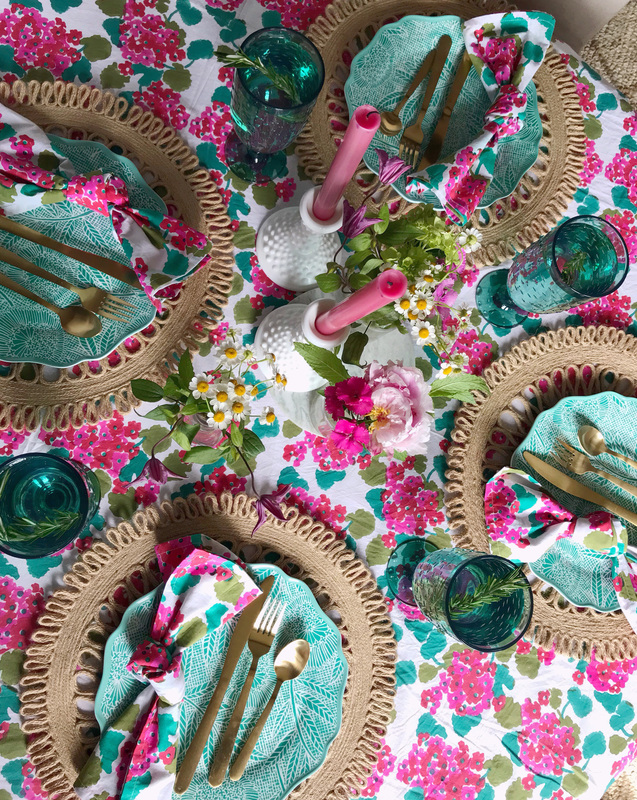 I picked some of the teal colored pieces and layered them on top of fun, ornate jute chargers. Using a charger is such a great way to add texture and depth to a place setting. 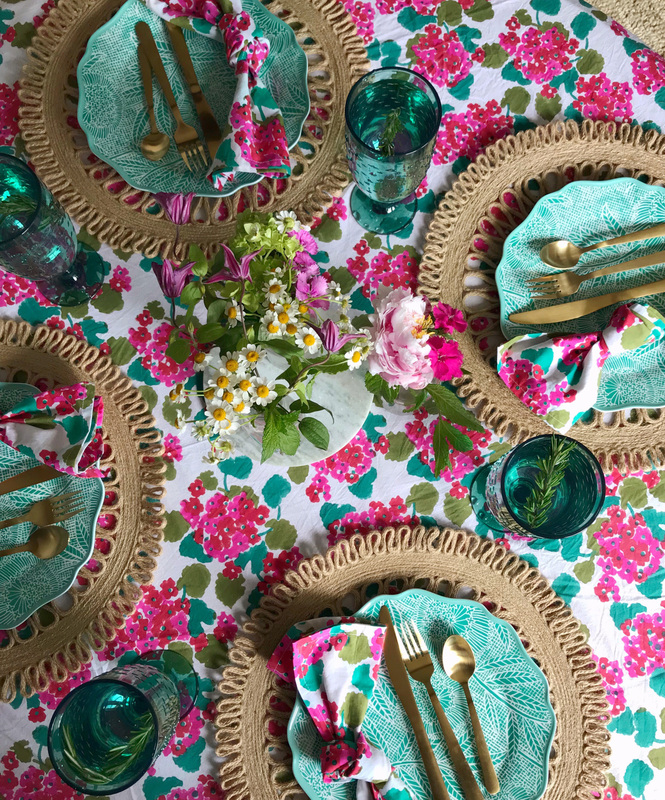 For summer parties, I always like to keep things on the casual side, so I tied off the matching fabric napkins in knots for a laid-back vibe. 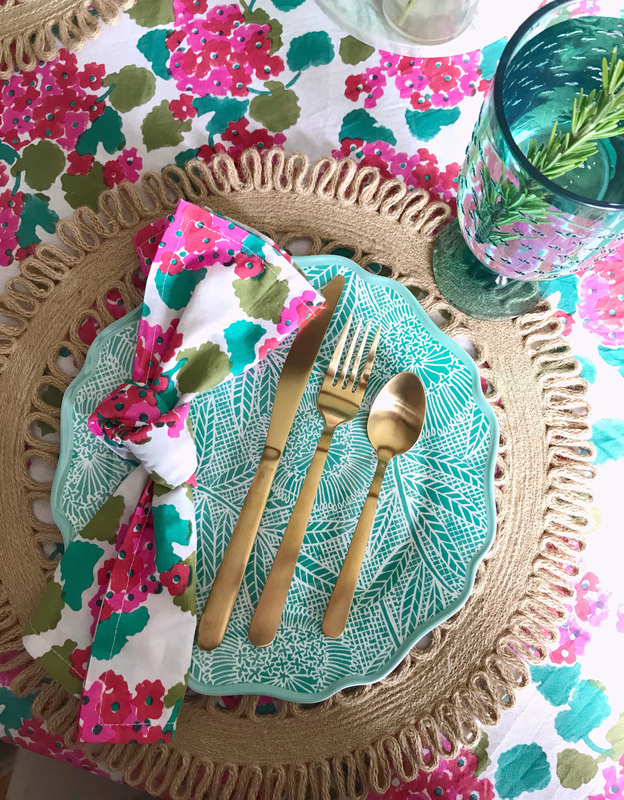 The place setting was paired with very simple gold flatware that also comes from Target; this line is open stock — so you can buy exactly how many forks, spoons, or knives you need, and it’s a steal for under $2 per utensil. It looks really luxe, but isn’t too precious for using with a relaxed summer menu. 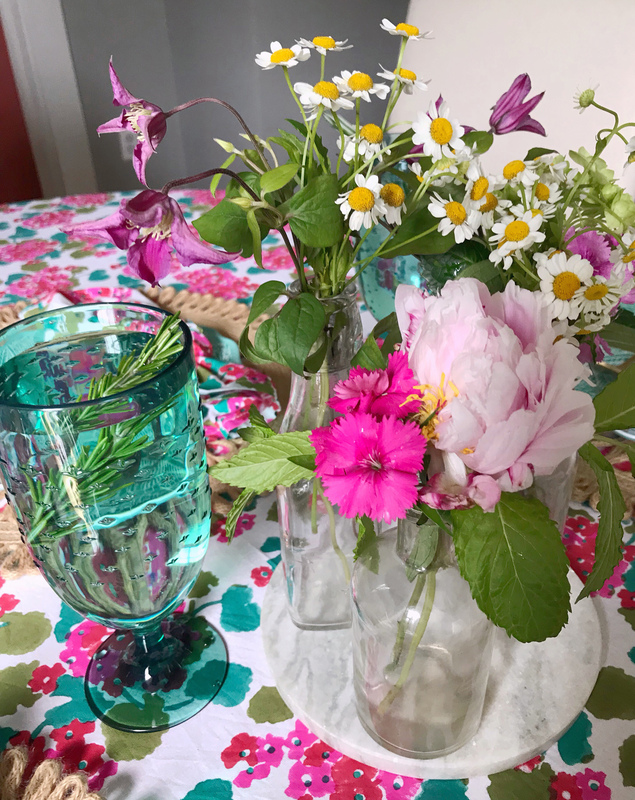 I finished off the look with some fresh flowers in a few clear glass vases and jars, keeping with that unfussy theme, added a few pink candles to pull the colors from the linens, and poured some rosemary infused water into the goblets for the final touch! Mini Berry Mascarpone Cakes. Memorial Day Party Ideas. One Response to "Colorful Summer Garden Party."